Christmas dinner is the best part of Christmas day, isn’t it? It’s everyone’s favourite meal of the year, whether you go traditional with a turkey, veggie with a nut roast or the question on everyone’s mind- to sprout or not to sprout! The table setting is just as important as the meal itself, a lot of effort (by mum) goes into the meal, putting effort into table decorations to make it look special is the least we can do to make the occasion memorable! There are so many options and colours to decorate the table with. Sometimes simple options can have the biggest impact. 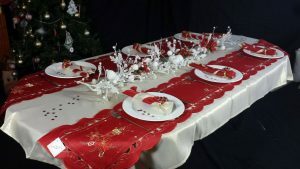 A good quality Christmas Tablecloth can be stunning on its own, or can be added to with runners, placemats, napkins etc. With so many different options, colour schemes and designs, it can become a bit daunting when choosing tableware, and knowing what’s too much or too little. We’ve come up with a little bit of inspiration to make your Christmas tablecloth choices a little easier! This table setting looks really impressive but is actually incredibly simple. Using a Glitterazi Christmas tablecloth, we’ve chosen a silver cloth but you can go with any colour, and adding two long table runners parallel on either side of the table, it adds a contemporary design to the table, also eliminating the need for placemats! This is also a great idea to mix and match for different styles over the festive period, you could swap this runner for gold, or embroidered table runners and have a completely different look for each time you sit down to eat. We used the red Lavish luxury table runner. We have also lots of different styles of napkins to match different tablecloth. 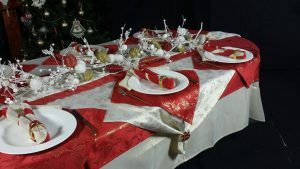 We’ve paired both red and silver napkins and just overlapped, wrapped and secured them with red poinsettia napkin rings. Very simple however it looks really lovely with the rest of the table setting. The Glitterazi Christmas tablecloth comes in both gold and silver, and in many different sizes. For a more traditional festive style we’ve chosen the tartan table runner and placemats. This is a cheap table runner and great if you are on a budget, which who isn’t at Christmas! This Christmas tablecloth is a plain white shell cloth. This is an ideal Christmas tablecloth as it is very versatile. The Shell is easy care as it is machine washable, non-iron and stain resistant which means it’s very Christmas dinner friendly! Even though it is a plain tablecloth, it is ideal as Christmas tablecloth as it is stylish with its textured weave and scalloped edge design. The Shell tablecloth is an ideal cloth for all year round use as it comes in many different colours, which will suit every type of style and decoration preference. We also stock a great selection of napkin rings such as these gold rings, an easy way to get out of napkin folding- nobody know’s how to do that unless you’re a butler from the 1890’s. For something slightly more adventurous, try layering small square tablecloths over a larger cloth. 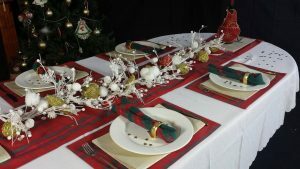 Using Christmas Tablecloths from the same style will help create the look without being too busy. We’ve used large and small Christmas tablecloths from the Jacobean range, and added red napkins from the same range instead of placemats. We’ve also used two different table runners, folded one and layered them on top of each other. The Jacobean Christmas tablecloths come in red, silver and gold with many different sizes to choose from. 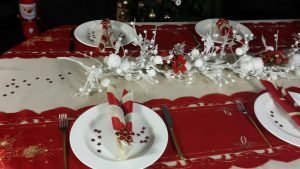 You can use lots of different designs, colours and styles of Christmas tablecloths, napkins and placemats to recreate these looks. If you want any help or advice with colour options or styles feel free to ask us and we’ll be happy to help! For all of our latest news and offers follow us on Facebook & Twitter.